In the early 2000s, Dannon developed Activia, a line of yogurt and smoothie products that contain a probiotic, or beneficial bacteria, created by the company and named Bifidus regularis. Eating Activia regularly promotes digestive system health, claims Dannon. The company offered customers a 14-Day Challenge involving daily Activia consumption, after which followers were promised they'd experience fewer digestive problems. Dannon has since extended the challenge to 28 days, but you can still easily follow the instructions for the original 14-day plan. Critics say there isn't sufficient evidence to back Dannon's claims of digestive health, though the plan may be beneficial for some people. On the original 14-Day Activia Challenge, followers who signed up for the program through Dannon received access to a website that provided three different options for nutritionist-developed breakfasts, lunches, dinners and snacks for each day of the two weeks. Two suggested meals or snacks every day included an Activia product. Exercise, lifestyle and cooking tips were also provided to participants, and a money-back guarantee was offered to those who could provide receipts for Activia purchased within a given time period and who felt the yogurt did not live up to the digestive health claims. The current 28-day version of the challenge does not provide menu plans or an exercise regimen, but it does require you to consume Activia twice daily for four weeks. A sample daily menu on the 14-Day Activia Challenge could begin with a breakfast of Activia vanilla yogurt mixed with nuts and oats or whole-grain toast served with cottage cheese and slices of tomato and avocado. Your morning snack might be fresh fruit or another container of Activia yogurt, while lunch could be a salad of hard-boiled eggs, cooked beans and canned salmon or a whole-grain chicken sandwich. Vegetable pasta and salad or lean beef with steamed vegetables might serve as dinner. Your bedtime snack might be Activia yogurt or hot milk spiced with cinnamon. A review published in the International Journal of Obesity in 2012 concluded that a low-calorie diet that includes dairy products promotes weight loss and helps increase lean muscle mass. A balanced, low-calorie version of the 14-Day Activia Challenge would fit these parameters. In addition, if you eat more low- or nonfat dairy products like yogurt and less red or processed meats, you'll be less likely to develop chronic medical problems like cancer or heart disease, reported an Archives of Internal Medicine study published in 2012. Harvard Medical School says probiotics like the Bifidus regularis in Activia may help relieve the symptoms of some digestive conditions and might maintain urinary health in women, but more research is needed. University of California Los Angeles gastroenterologist Kirsten Tillisch says that objective clinical studies proving that specific bacterial strains, including Bifidus regularis, are better than others for digestive health are lacking. Research conducted on the benefits of Activia were funded by Dannon, points out Tillisch. Any positive results may not be easily replicated in real life, especially if followers fail to eat the large amount of yogurt required daily. In 2010, Dannon was required to pay $45 million to settle a class action lawsuit filed by claimants who said Activia did not live up to its advertisements of improved digestive health. 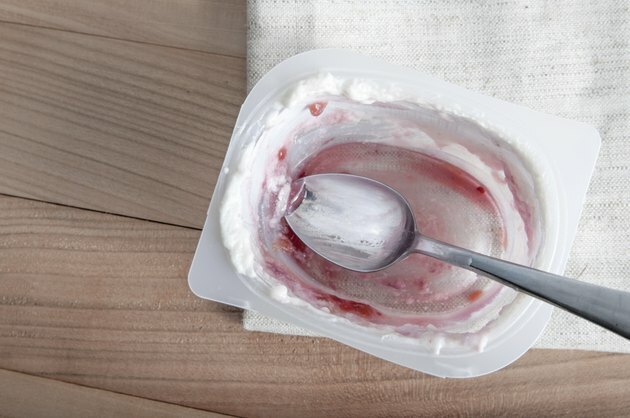 Unless you're careful to control your overall caloric intake, adding two servings of yogurt to your regular diet may cause you to gain weight.